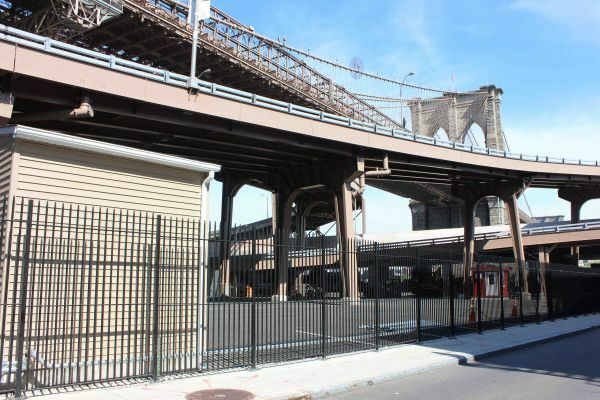 The Falcon Aluminum Picket Fence was selected for the ground level of the Brooklyn Bridge update. Falcon Panels have simple, clean lines enhancing the prestige and security of any setting. 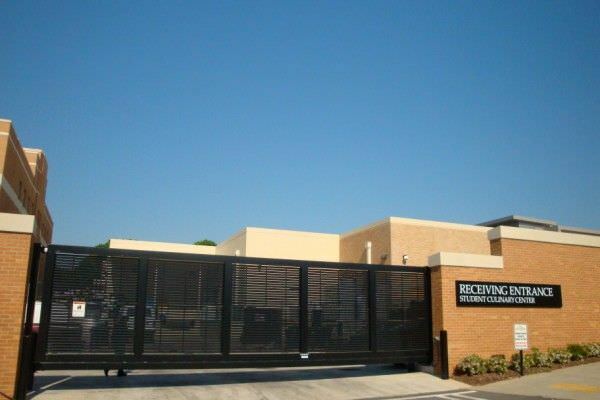 From schools, to medical facilities, to sports and leisure complexes, to industrial buildings and military bases, FALCON DESIGN aluminum fence is flexible to meet all your needs. FALCON DESIGN aluminum fence panels are fabricated to your requirements then powder coated for a maintenance free protection and beautiful finish. Ametco Manufacturing Corporation galvanized steel fixed louver Shadow 100 Design double swing gates where used at Arbor Elementary School in Euclid, Ohio. The Shadow 100 Design fixed louver provides 100% direct visual screening. Shadow design is also available as Shadow 80 for 80% direct visual screening. After fabrication the steel gates are hot dipped galvanized then powder coated for lasting beauty. The polyester powder coating is available in 15 standard colors or match to the color of your choice. The color coating gives the gates an extra touch of appeal to harmonize with its surroundings. All of Ametco architectural products are manufactured in the USA. 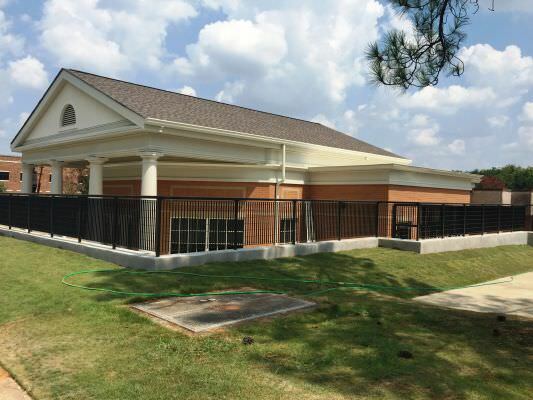 AMETCO’S METRO DESIGN steel railing was installed at the John Knox Manor in Montgomery, Al. Metro Design railing is electro-forged welded steel with a 1” x 1/8” main bar and 3/16” round cross bars with a 2-7/16” x 5-3/16” mesh. The METRO DESIGN steel railing is fabricated then hot dip galvanized before being powder coated to one of Ametco’s 15 standard color or a matching color of your choice for the best protection to assure maintains free life. Metro design is one of six designs Ametco manufactures at our Willoughby, Ohio plant in the USA. 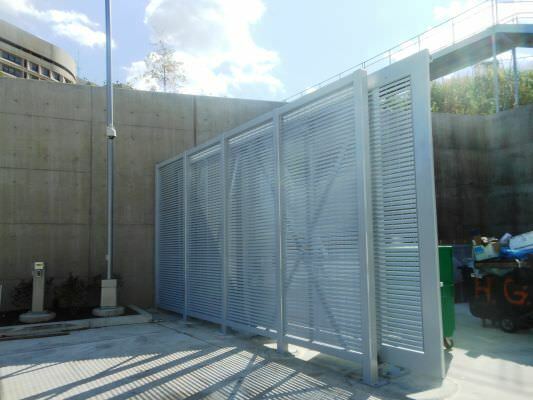 AMETCO’S METRO DESIGN steel security fencing was installed at the Arlington County Water Pollution Control plant in Arlington, Va. Metro Design fencing is electro-forged welded steel with a 1” x 1/8” main bar and 3/16” round cross bars with a 2-7/16” x 5-3/16” mesh. The METRO DESIGN steel fencing is fabricated then hot dip galvanized before being powder coated to one of Ametco’s 15 standard color or a matching color of your choice for the best protection to assure maintains free life. Metro design is one of six designs Ametco manufactures at our Willoughby, Ohio plant in the USA. Ametco Manufacturing’s Aluminum double swing gates with Eclipse 100 Design infill panels were used at the Marina San Pablo. 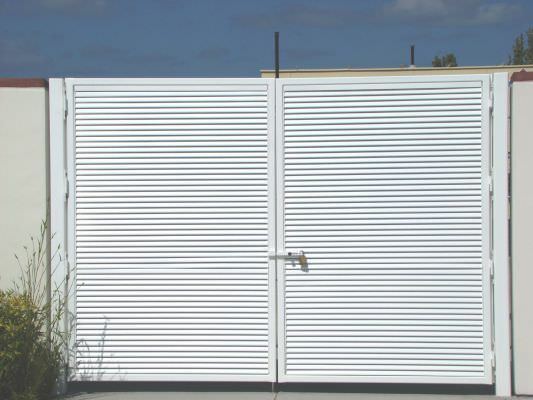 Eclipse 100 Design fixed louver fencing provides 100% direct visual screening. After fabrication the aluminum double swing gates are powder coated to one of Ametco’s 15 standard colors. The choice of color allows the swing gates to harmonize with any setting and provides years of maintenance free beauty. In addition the swing gates Ametco manufactures a complete line of V-Wheel roller gates and Cantilever gates in both steel and aluminum. All of Ametco’s Architectural Products are manufactured in Willoughby, Ohio in the USA. 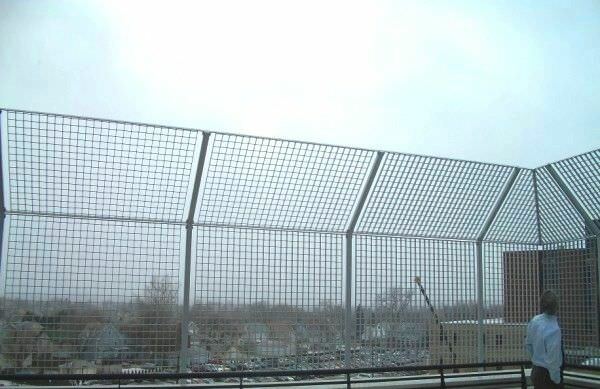 AMETCO’S STEEL SECURITY FENCE, STADIUM DESIGN was used in Washington, DC on the Capitol Street Bridge. The fence panels have anti-intruder panels on the top to prevent people or objects from going over the top and onto the road below. Stadium design is electro-forged welded steel bar 1”x 1/8” on 3-15/16” center with 3/16” cross bars on 3-15/16” centers. Ametco fencing is protected by an extremely effective coating system, giving long life with a touch of elegance. 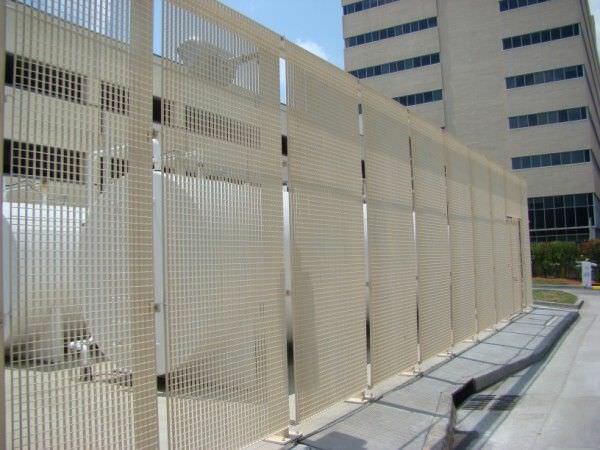 The hot dip galvanized finish with a polyester powder coating gives Ametco fencing protection from the elements and eliminating costly maintenance. All of Ametco fencing is manufactured in our Willoughby, Ohio plant in the USA. 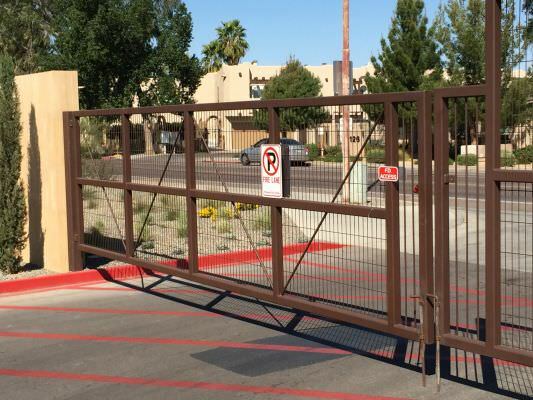 Ametco’s AMOPANEL WELDED WIRE FENCE AND GATES were used at All Saints Episcopal Church and Day School in Phoenix, AZ. Amopanel Design provides a high degree of stability due to the folds used for strengthening. This feature also makes Amopanel Design visually more attractive. 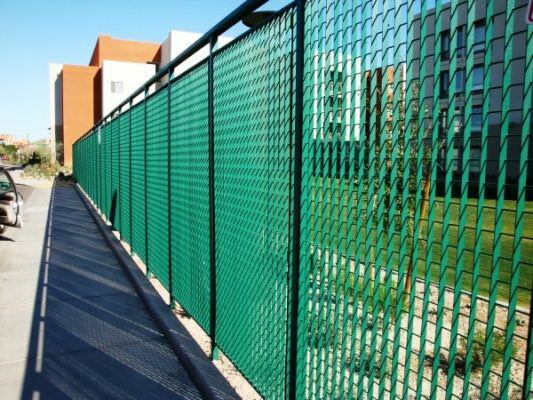 Amopanel has 2” x 8” mesh with 3/16” vertical and horizontal wire and 1 to 5 V-shaped stabilizing folds depending on the height of the fence. Amopanel comes in panels 8 feet wide and 4, 5, 6, 8 feet high. Panels are connected to 2 inch tube post with fasteners. 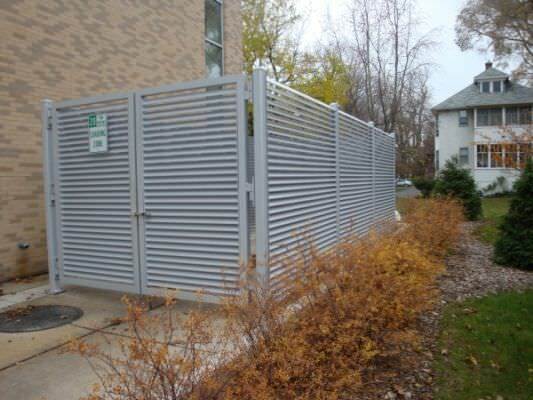 Ametco Manufacturing Corporation galvanized steel fixed louver Shadow 100 Design double swing gates where used at Plaza 833 in Schererville, IL. 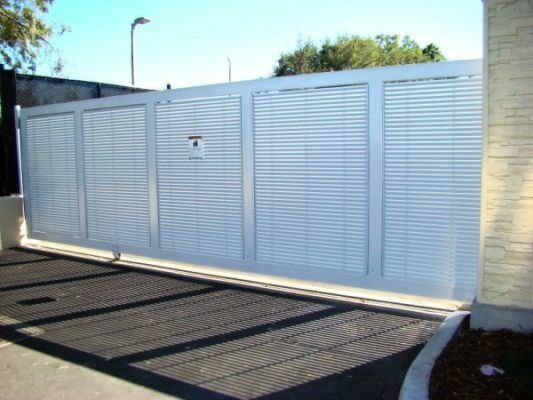 The Shadow 100 Design fixed louver double swing gates provide 100% direct visual screening. Shadow design is also available as Shadow 80 Design for 80% direct visual screening. After fabrication the steel gates are hot dipped galvanized then powder coated for lasting beauty. The polyester powder coating is available in 15 standard colors or match to the color of your choice. The color coating gives the gates an extra touch of appeal to harmonize with its surroundings. All of Ametco architectural products are manufactured in the USA. AMETCO’S STEEL SECURITY GRILLES STADIUM DESIGN was used at BALL STATE UNIVERSITY in Muncie, Indiana by A & L Manufacturing. STADIUM DESIGN is one of AMETCO’S electro forged welded steel grilles that is fabricated to order, then hot dipped galvanized before it is powder coated to the color of your choice. The combination of hot dip galvanizing and powder coating gives the grilles the best corrosion protection on the market today. In addition to the STADIUM DESIGN which is a 3-15/16” square mesh, AMETCO offers 5 additional electro forged designs. 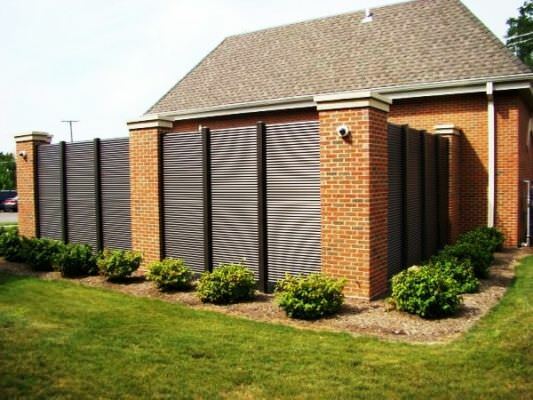 All of Ametco’s grilles and fence products are manufactured in the USA at our Willoughby, Ohio plant. . 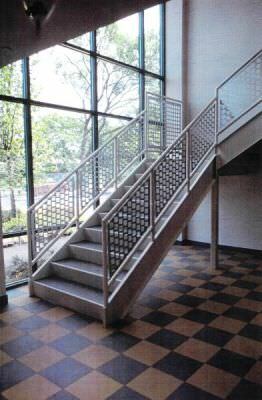 The Steel Open Mesh Railing at The WEST CHESTER UNIVERSITY is AMETCO’S GROTTO DESIGN with a mesh size of 1-21/32” x 5-3/16”. 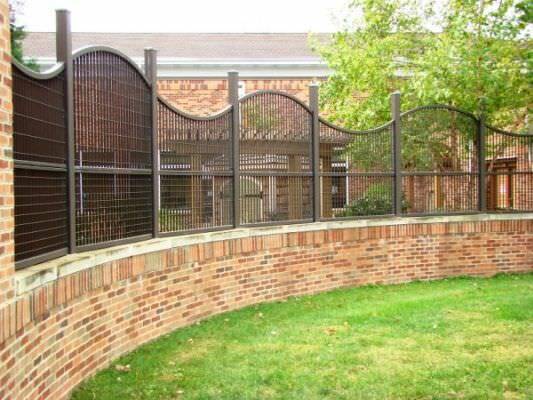 Ametco Grotto Design is electro-forged welded steel railing infill panels. After fabrication the Grotto Design is hot dip galvanized then coated with a polyester powder coating for the best corrosion protection in the industry. The choice of color gives an “extra” touch of appeal to the railing, harmonizing with its surrounding. Ametco also manufactures perforated aluminum railings and aluminum blade railings. All of Ametco railing systems are manufactured in the USA at our Willoughby, Ohio plant. JACKSON LABORATORY FOR GENOMIC MEDICINE is the site of AMETCO MANUFACTURING CORPORATION’S SHADOW 80 DESIGN fencing and gates. This 24 foot wide x 12 foot high bi-parting monorail cantilever gate and fencing was installed by EDI LANDSCAPE LLC. CONNECTICUT. Ametco’s Shadow 80 Design provides 80% direct visual screening. After fabrication all of Ametco’s steel products are hot dip galvanized then powder coated. Ametco fixed louver steel products are Shadow 100 and Shadow 80. Ametco also produces aluminum fixed louver designs, Titan, Phoenix, Venetian, Eclipse and Saturn. All of Ametco’s products are manufactured in USA at our Willoughby, Ohio plant. 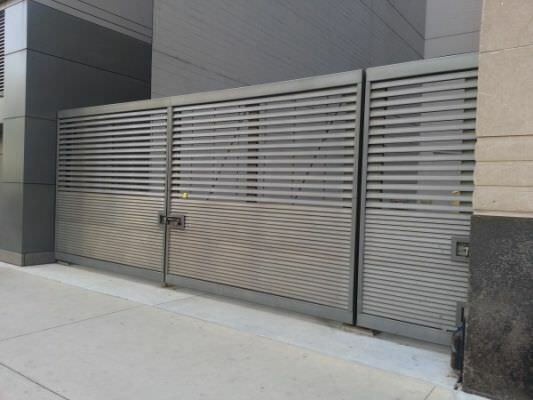 AMETCO’S Venetian Design Aluminum Fixed Louver double swing gate was used at 108 N. State St. in Chicago, IL by Midwest Fence. The Venetian Design allows for different percent of visual screening from 50% to 100% in the same double swing gate. This is true of all of AMETCO’S aluminum fixed louver designs. After fabrication the Venetian Design is polyester powder coated to one of Ametco’s 15 standard color or matched to your choice of color for long lasting maintenance free beauty. All of Ametco’s aluminum fences and gates are manufactured in the USA at our Willoughby, Ohio plant. 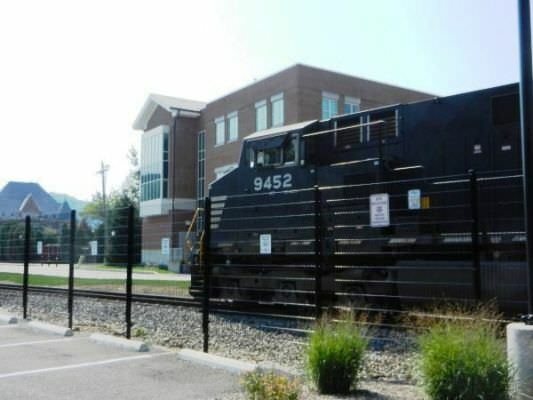 Ametco’s Shadow 100 Design double swing gates were used at THE NORTH ROYALTON LIBRARY to enclose a trash area. Ametco’s Shadow Design can be furnish with either 80 or 100% direct visual screening. All of Ametco’s gates are fabricated to size to meet your requirements. 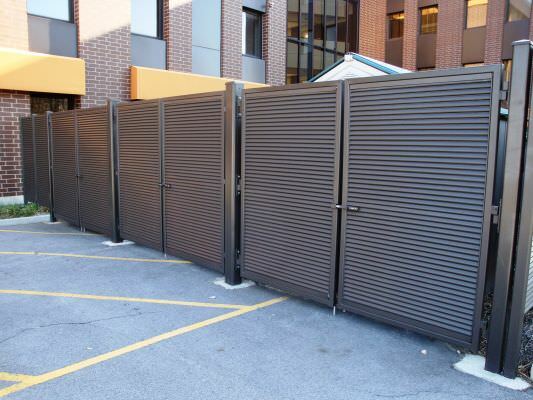 Shadow 100 design, like all of AMETCO’s fixed louver steel fencing is galvanized after fabrication then powder coated to give an “extra” touch of appeal to the gates, harmonizing with its surroundings. All of Ametco’s fence and gates are manufactured in the USA at our Willoughby Ohio plant. 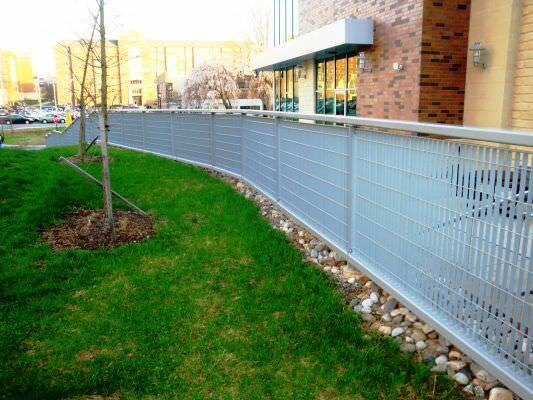 Ametco Manufacturing Corporation Saturn design aluminum fencing was used at the Bucks City Community College. The Saturn Design has a front and back row of ½” x 4” aluminum extruded tubes on 1” centers. Each row of tubes are on 4” centers for 100% direct visual screening. After fabrication the Saturn design is powder coated to one of Ametco’s 15 standard colors to harmonize with its surroundings. This long lasting coating system ensures protection from the elements and virtually ends maintenance. 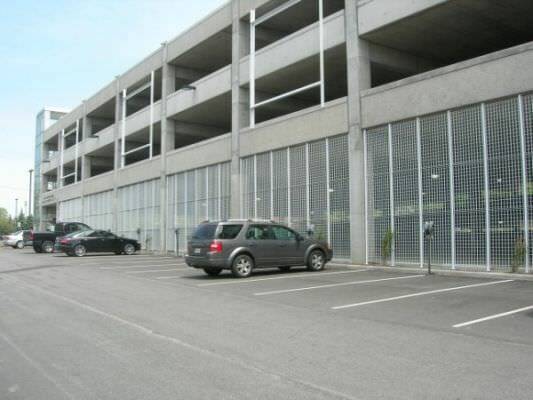 AMETCO’S STEEL SECURITY GRILLES METRO DESIGN were used at the BAUM SQUARE PARKING GARAGE.. The METRO DESIGN one of AMETCO’S electro forged welded steel grilles that is fabricated to order, then hot dipped galvanized before it is powder coated to the color of your choice. The combination of hot dip galvanizing and powder coating gives the grilles the best corrosion protection on the market today. In addition to the METRO DESIGN which is 2-7/16” x 5-3/16”” mesh, AMETCO offers 5 additional electro forged designs. All of Ametco’s grilles and fence products are manufactured in the USA at our Willoughby, Ohio plant. .
Ametco’s Metro Design steel security fencing and gates were used at the VA Hospital in Coatsville, Pa.. All of Ametco’s fencing and gates are fabricated to size to meet your requirements. Metro design, like all of Ametco’s steel security fencing is galvanized after fabrication then powder coated to give an “extra” touch of appeal to the fencing and gates, harmonizing with its surroundings. All of Ametco’s fencing and gates are manufactured in the USA at our Willoughby Ohio plant. 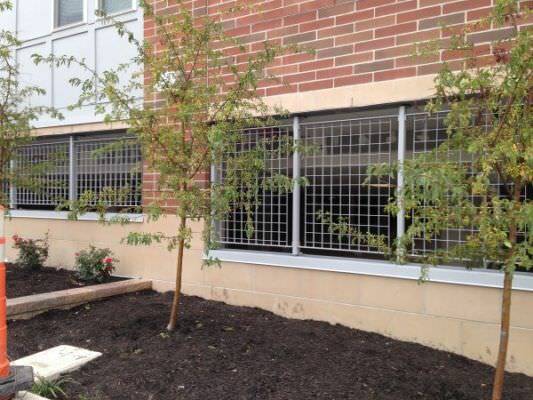 Aluminum Fixed Louver fence and gates Venetian Design were used at the Maplewood School in Sylvania, Ohio. The Venetian Design unique design is the only louver design that can be used either vertically or horizontally and still provide 100% visual screening. After fabrication the Venetian Design is polyester powder coated to one of Ametco’s 15 standard color or matched to your choice of color for long lasting maintenance free beauty. All of Ametco’s aluminum fences and gates are manufactured in the USA at our Willoughby, Ohio plant. 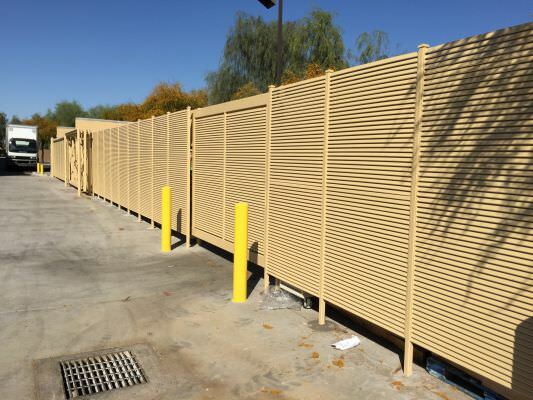 Ametco Manufacturing Corporation’s Lattice Design galvanized steel fence was used at ASU in Tempe, Az. Lattice Design steel fencing is electro forged welded steel that is fabricated than hot dip galvanized before being powder coated for the best maintenance free finish with a 20 year warranty. The choice of color can be any of Ametco’s 15 standard colors or a custom color of your choice. The Lattice Design has a 2-7/16” x 2-19/32” mesh with a 1” x 1/8” main bar and 3/16” round cross bar. Ametco’s steel fencing is manufactured in the USA at our Willoughby, Ohio plant. 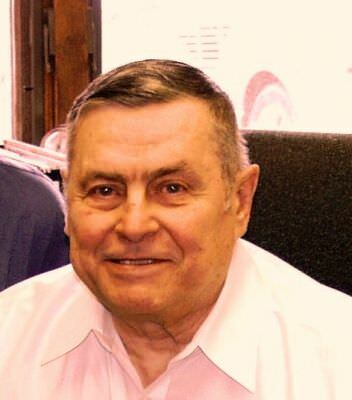 A Celebration of Life was held on November 17, 2012 for Steve G Mitrovich, November 10, 1931 – November 8, 2012, at the Mentor Harbor Yacht Club were Steve was a past commodore. Steve founded Ametco Manufacturing Corporation in 1966 as a job shop metal fabricator. Based on the number of employees that worked for Steve for over 40 years one can see that Steve was a great boss and very successful business man. Today Ametco is a nationally recognized leader in the manufacturing of architectural products, fencing, gates, railings and sunshades. Today Ametco is led by Steve’s son Greg who is continuing Steve’s philosophy that if you do what is right by your customers and employees everyone will benefit. 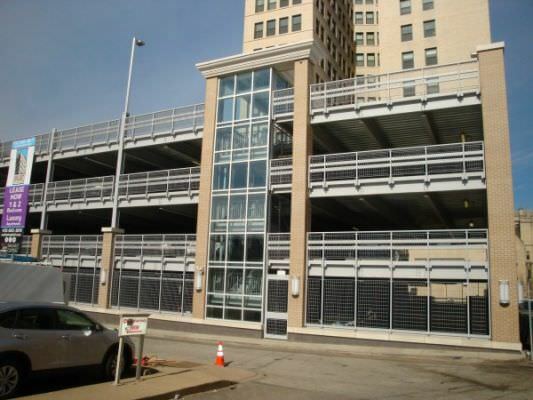 AMETCO’S STEEL SECURITY GRILLES LATTICE DESIGN were used at the CEDAR LEE PARKING GARAGE in Cleveland Heights, Ohio. The LATTICE DESIGN one of AMETCO’S electro forged welded steel grilles that is fabricated to order, then hot dipped galvanized before it is powder coated to the color of your choice. The combination of hot dip galvanizing and powder coating gives the grilles the best corrosion protection on the market today. In addition to the LATTICE DESIGN which is 2-7/16” x 2-19/32” mesh AMETCO offers 5 additional electro forged designs. 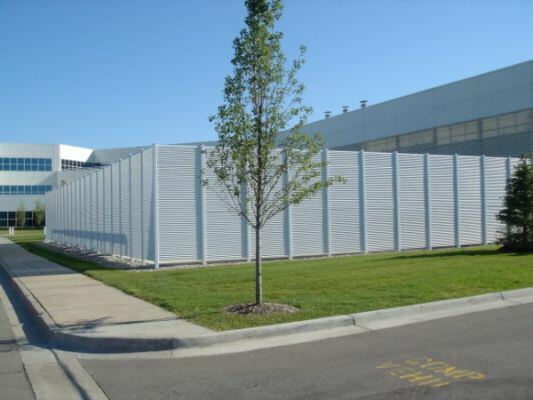 All of Ametco’s grilles and fence products are manufactured in the USA at our Willoughby, Ohio plant. .
Aluminum fixed louver fence was used at Northwestern University for a trash enclosure. 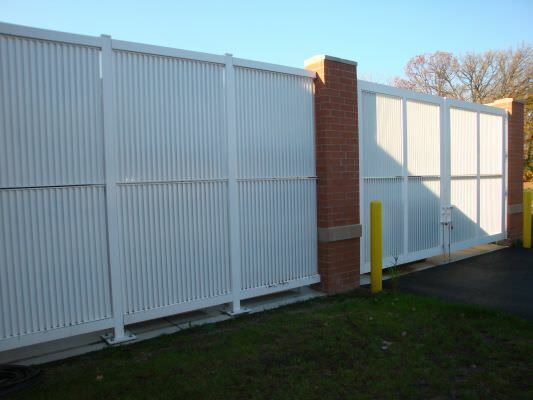 Ametco’s Phoenix Design aluminum fence was manufactured in the USA at Ametco’s Willoughby, Ohio plant. Phoenix Design can be furnished with 80 or 100 percent direct visual screening. The enclosure included a double swing gate with a padlockable slide bolt. 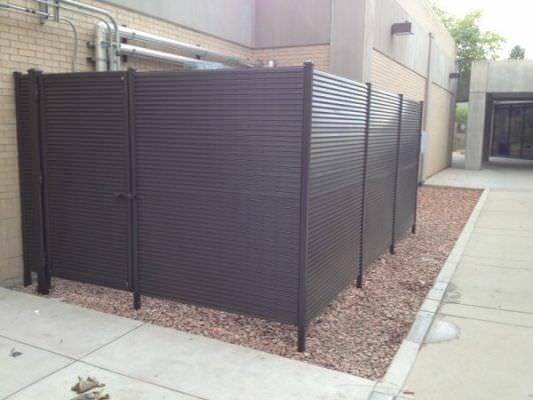 After fabrication the Phoenix Design fixed louver aluminum fence was powder coated. The choice of color gives an extra touch of appeal to the fencing, harmonizing with its surroundings. The Phoenix Design is one of five styles of fixed louvered aluminum fencing manufactured by Ametco. Ametco’s PERFORATED RAILING infill panels were used at the Clinton Court in New York by AMIE GROSS ARCHITECTS. 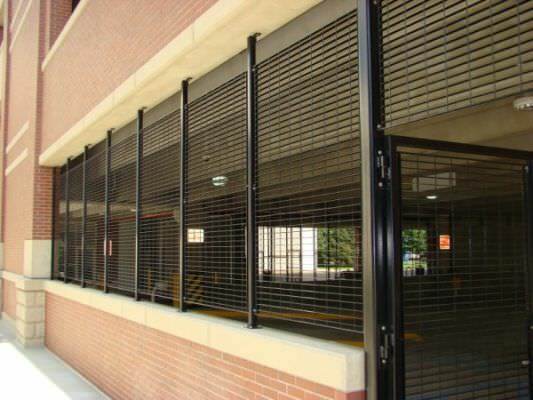 The advantage of perforated railing systems is the wide selection of patterns that you have to choice from. Round perforations, square perforations, slotted perforation in either straight row or staggered centers are a few of the choices. Shown is a square perforation on staggered centers. After fabrication the perforated railings are powder coated to one of Ametco’s 15 standard colors or any RAL color of you choice to harmonize with its surroundings. 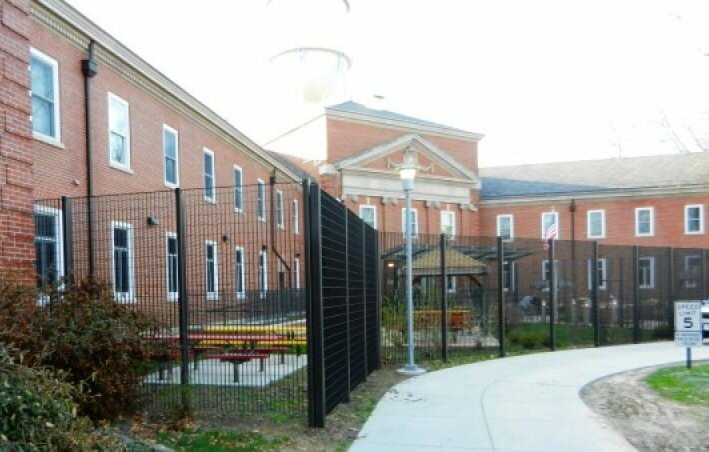 All of Ametco’s architectural products are manufactured in USA at our Willoughby, Ohio plant. .
AMETCO’S aluminum fence ECLIPSE 100 DESIGN was used at the RIVERSIDE K-8 SCHOOL IN CLEVELAND, OHIO. The ECLIPSE 100 DESIGN is aluminum fence that provides 100% direct visual screening. Fabricated from aluminum extrusions then powder coated to one on Ametco’s 15 standard colors so the aluminum fencing can harmonize with its surroundings. ECLIPSE 100 DESIGN aluminum fence can also be furnished with 80% direct visual screening. Ametco recommends that the ECLIPSE 100 DESIGN is used horizontally for the best vision control. ECLIPSE DESIGN as is Ametco’s entire aluminum fence line is manufactured in the USA at our Willoughby Ohio plant. .
Morgan Hill Court House in Morgan Hill, Ca. 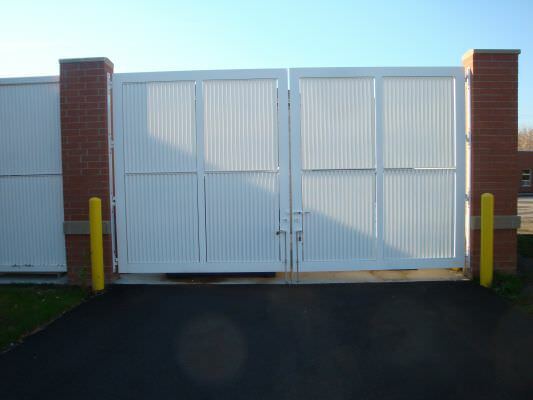 utilizes Ametco’s steel security Shadow 100®Design for their double swing gate. Shadow 100 design provides 100% direct visual screening. 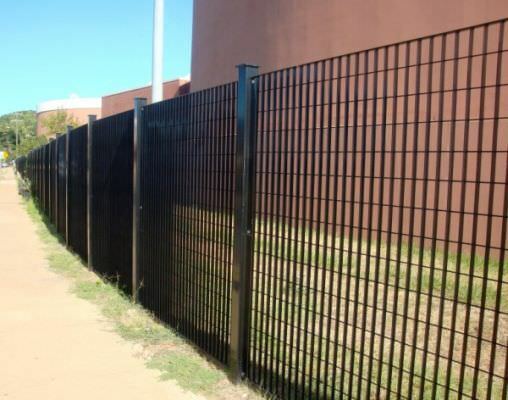 Shadow®Design is an electro-forged welded steel security fence that is galvanized after fabrication then powder coated to one of 15 standard colors or custom color of your choice. The color gives an “extra” touch of appeal to the gates harmonizing with its surroundings. The padlockable slide bolt is manufactured by Ametco for uses on their complete line of swing gates. 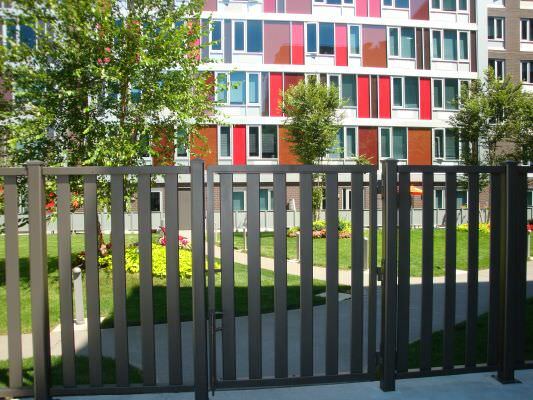 The aluminum fence and gate Venetian Design was used at The Avenue Forsyth in Atlanta, Ga. The 30 foot wide x 14 foot 7 inches high is one of the largest double swing gates Ametco has built. The Venetian Design aluminum fence infill panels provide 100% visual screening but allowed air flow because of it’s fixed louver design. 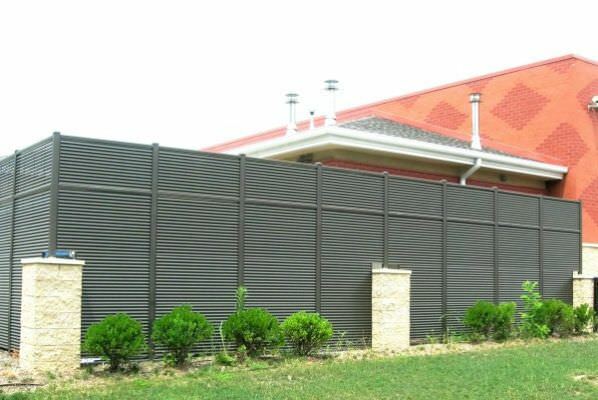 The Venetian Design is the only Ametco fixed louver aluminum fence that allows 100% visual screening in any direction. 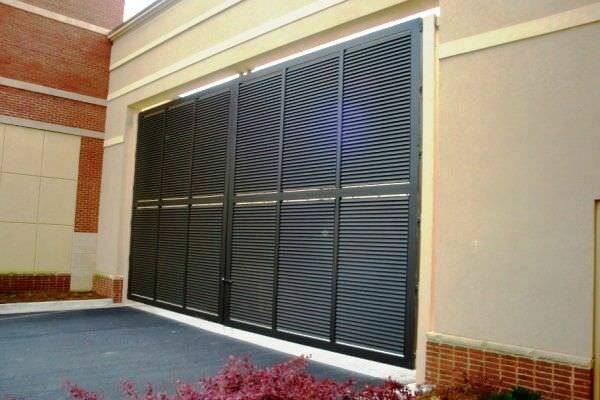 This allows the louver to run either vertically or horizontally and still provide 100% visual screening. The Venetian Design Aluminum Fence, as is all of Ametco’s aluminum fence designs, is manufactured in the USA at our Willoughby, Ohio plant. 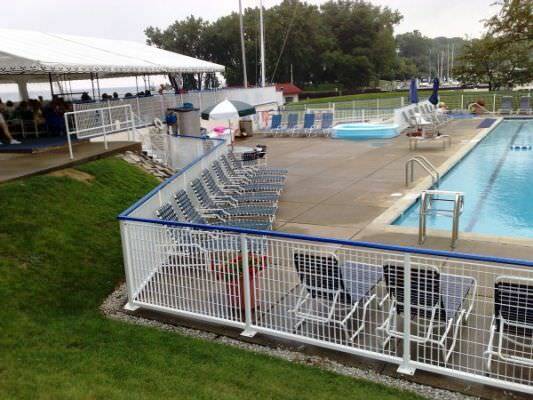 The steel railings at the Mentor Harbor Yatch Club in Mentor, Ohio is Ametco’s Metro Design with the aluminum top rail. 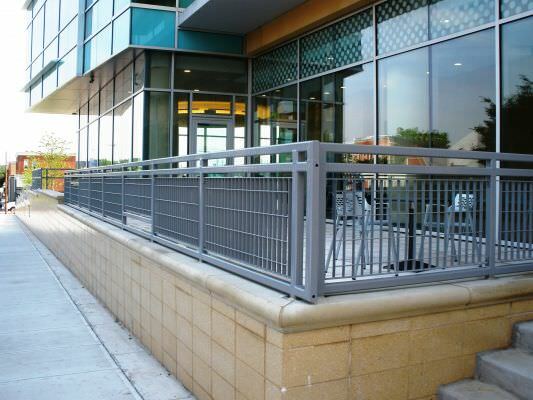 The Metro Design steel railing was custom fabricated then hot dipped galvanized before powder coating was applied. Metro Design 2-7/16” x 5-3/16” mesh with 1” x 1/8” main bar is one of 6 standard mesh sizes available in forged welded steel railings by Ametco. The choice of color gives an “extra” touch of appeal to the railing , harmonizing with the surroundings. For more information on Ametco railing systems click here. Welded Wire Fence Fiesta Design was used at the California University in Pennsylvania between the parking lot and railroad tracks that runs thru the campus.The Fiesta Design by Ametco Manufacturing Corporation has a 2 inch x 8 inch mesh with 5/16 inch double horizontal wire and a ¼ inch vertical wire. As all of Ametco’s weldedwire fencing, the Fiesta Design is available hot dip galvanized and powder coated to one of our 15 standard colors. 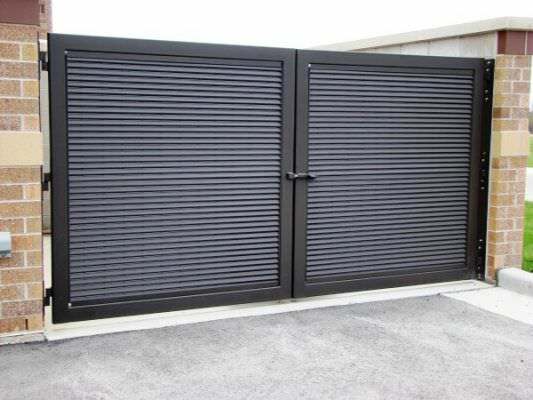 The Fiesta Design can also be used as infill panels in any of Ametco,s gates systems. For more information about Ametco's welded wire fence click here. Ametco Manufacturing Corporation Shadow 80 Design steel fixedlouver design was used at the Frendship Church in Charlotte, North Carolina to enclose a equipment area. The Shadow 80 design provided 80% direct visual screening and the louver design allowed air flow for the equipment enclosed. The steel double swing gates and fencing were fabricated to size and then hot dipped galvanized. 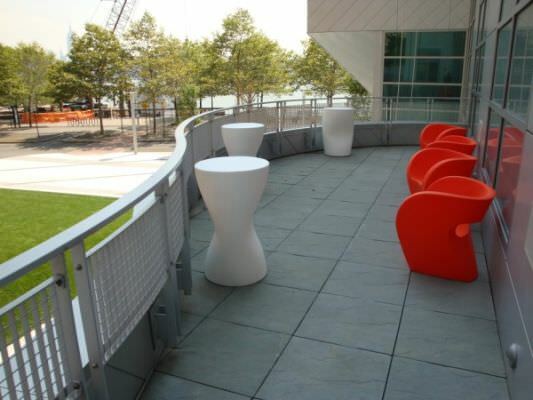 After being galvanized the material was powder coated to one of 15 standard colors to harmonize with its surroundings. This long lasting coating system ensures protection from the elements and virtually ends maintenance. 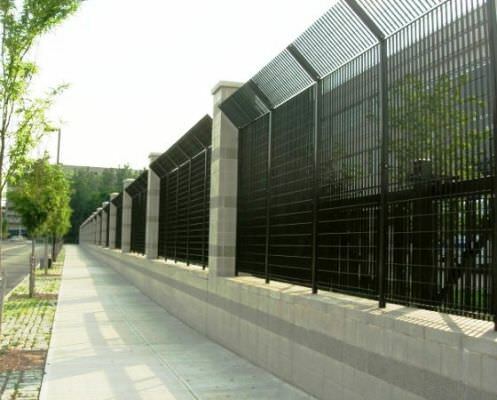 For more information on Ametco's fixed louver steel fence click here. 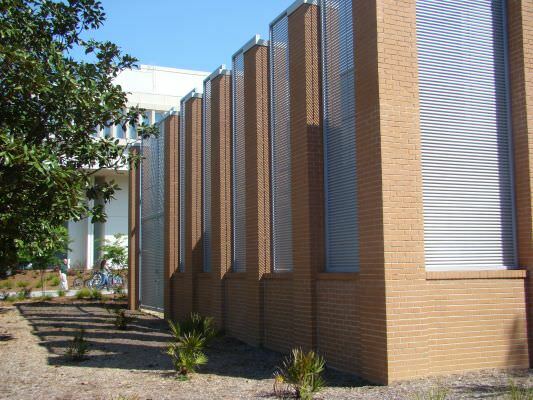 Architect Gresham, Smith and Partners designed the fuel tank platform and central energy plant enclosures at the Memorial Hospital in Jacksonville Fl. using Ametco’s Shield Design steel fencing. 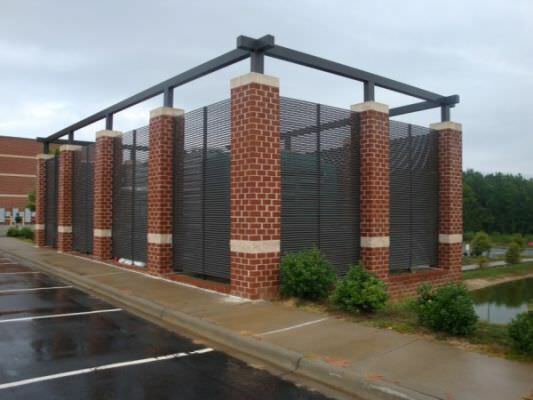 The enclosures were installed by Brasfield & Gorrie LLC. Shield Design with a mesh size of 1-21/32” x 1-3/4” is Ametco’s smallest opening electro-forged welded steel fencing. After fabrication the Shield Design is hot dip galvanized then coated with a polyester powder coating for the best corrosion protection in the industry. The choice of color gives an “extra” touch of appeal to the fencing, harmonizing with its surrounding. 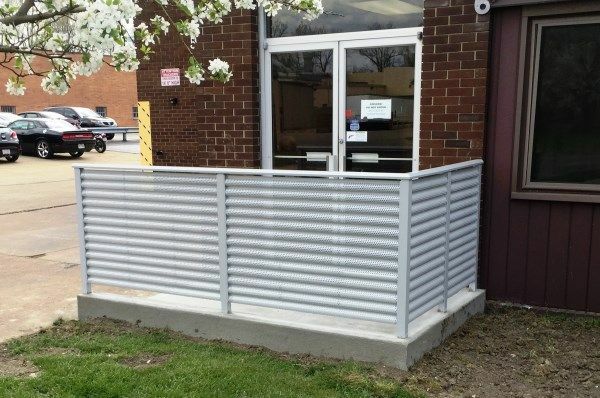 AMETCO’S aluminum fence ECLIPSE 100 DESIGN was used at the WAYNE COUNTY PUBLIC LIBRARY in Ohio. The ECLIPSE 100 DESIGN is aluminum fence that provides 100% direct visual screening. Fabricated from aluminum extrusions then powder coated to one on Ametco’s 15 standard colors the aluminum fencing can harmonize with its surroundings. ECLIPSE DESIGN aluminum fence can also be furnished with 80% direct visual screening. Ametco recommends that the ECLIPSE DESIGN is used horizontally for the best vision control. ECLIPSE DESIGN as is Ametco’s entire aluminum fence line is manufactured in the USA at our Willoughby Ohio plant. 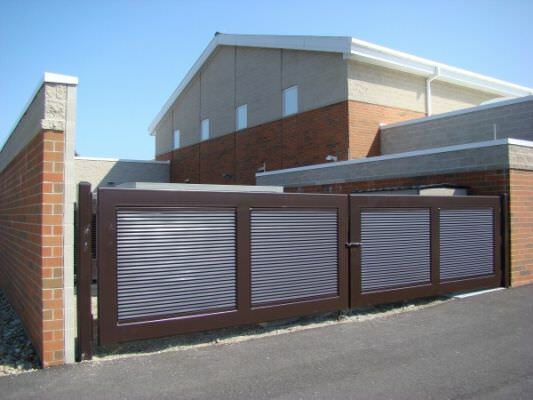 Ametco Manufacturing Corporation Shadow 100 Design steel fixed louver design was used at the Brookfield Academy in Wisconsin to enclose a dumpster area. The Shadow 100 design provided 100% direct visual screening and the louver design allowed air flow for the equipment enclosed. The steel double swing gates and fencing were fabricated to size and then hot dipped galvanized. After being galvanized the material was powder coated to one of 15 standard colors to harmonize with its surroundings. This long lasting coating system ensures protection from the elements and virtually ends maintenance. 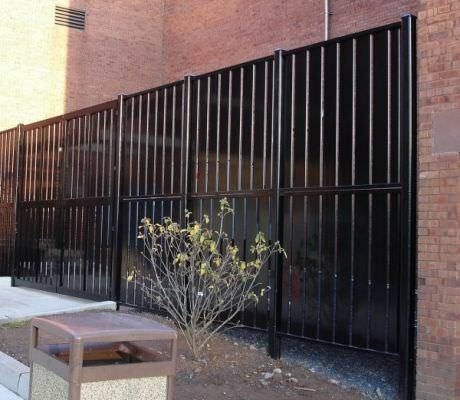 A New York city high school utilizes Ametco’s steel security fence and gates Metro® Design with anti-intruder top panels. In addition to the fencing the project included a v–track steel roller gate and a bi-folding double swing gate. 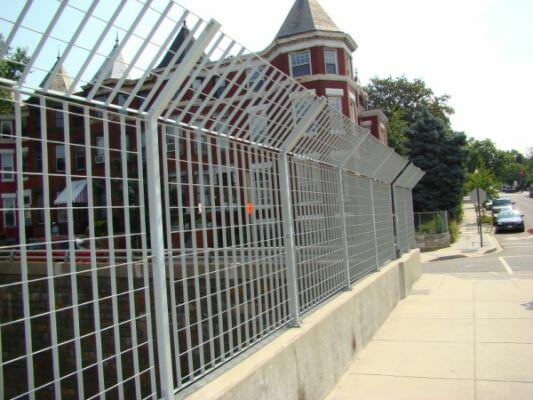 Metro® Design is an electro-forged welded steel security fence that is hot dip galvanized after fabrication. The galvanized fence and gates are then powder coated with one of 15 standard colors. The color gives an “extra” touch of appeal to the fencing and gates harmonizing with its surroundings. Ametco furnished the perforated aluminum panels that were used at the Central Illinois College Cougarplex in Peoria, Il. 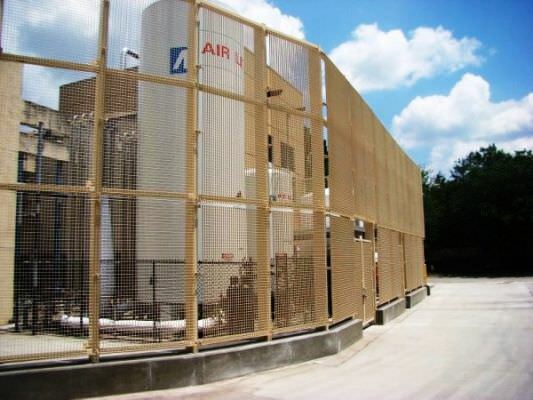 The custom perforated panels were sold to CEI Composite Materials, LLC of Manchester, Mi who did the installation and furnished Ametco with the following review. “Our project for the Central Illinois College Cougarplex turned out looking great. 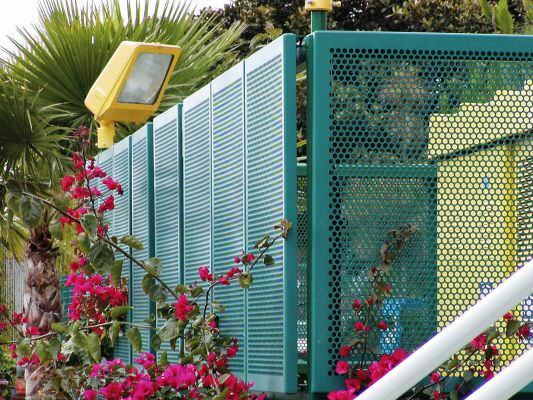 We were completely satisfied with the quality of our perforated panels that Ametco provided. 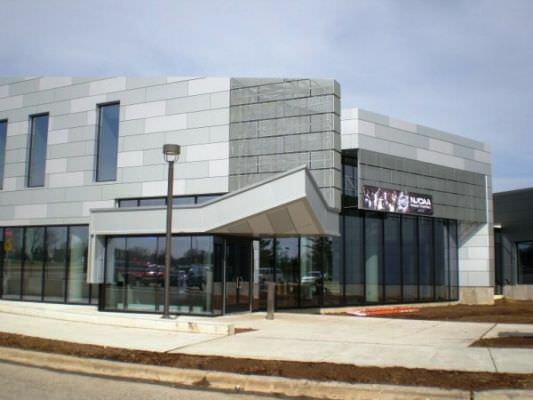 Here are some completion photos to share with your team.” Ametco would like to thank CEI Composite Material, LLC and Central Illinois College for using our perforated panels on this great project. 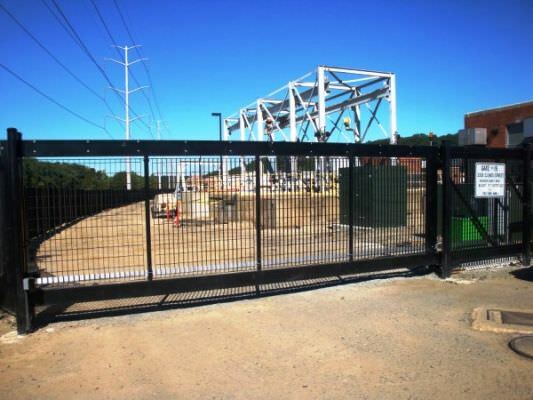 Ametco Metro design steel security fence and gates were installed at the Arlington County Waste Water Pollution Control Treatment Plant in Arlington Virginia by Long Fence Co. 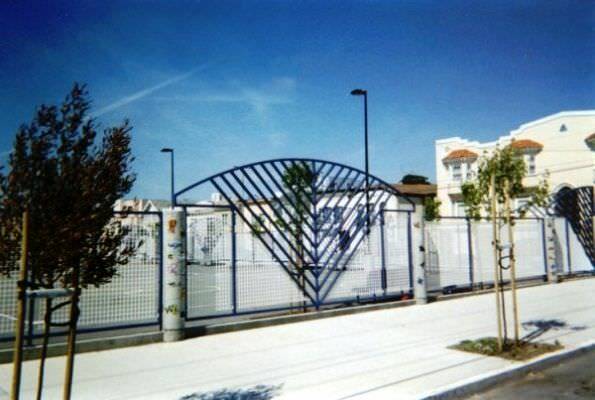 The picture above is one of the many gates installed on this site. This one is a 20’0” wide cantilever gate with the Metro design infill panel galvanized and powder color coated to match the three city block area secured with 8’0” tall Metro design fencing & posts. 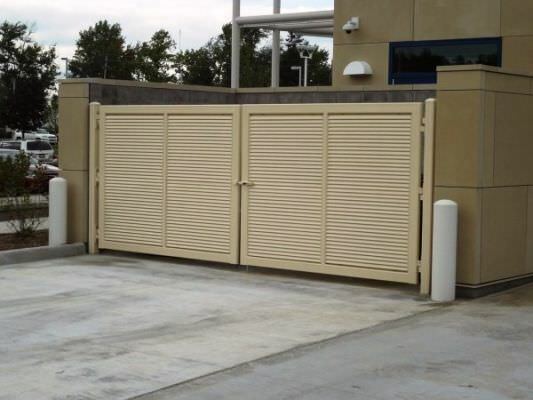 The largest sliding gate on this job secured a 30’0” wide opening made as a single framed unit. Additional security was provided with the option of using Ametco’s 4” square tubular line posts fabricated for easy panel installation by pre drilling and tapping mounting holes in our factory giving precise line up with the fencing panels. For more information click here.